What happens when an artist engages with an aphoristic text? What if the artist were paired up with a collaborating writer who has the task of documenting the artist’s work which responds to the same aphoristic text? How would such a dynamic collaboration evolve? The (met)afourisms project seeks to present an answer to these questions, and takes effect at the point of intersection where the allusive and elusive style of aphoristic prose meets with the understanding of metaphor as a medium of transference and translation. 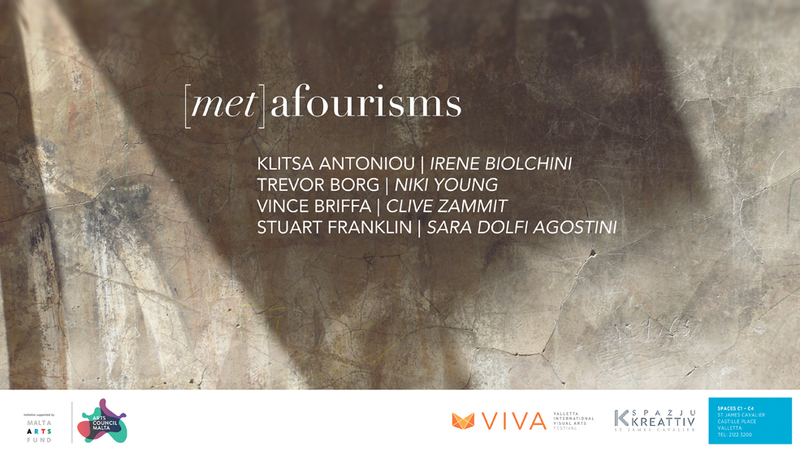 (met)afourisms constitutes the work of four artists and the writing of their respective collaborators. Each of the artists involved in the project – Klitsa Antoniou (Cyprus), Trevor Borg (Malta), Vince Briffa (Malta) and Stuart Franklin (England) – responded by means of an artwork (or series of artworks) to their assigned aphoristic text. The role of each artist was to translate the aphorism in order to extrapolate and generate new meanings from existing ones. Each of the aforementioned artists was in turn paired with a collaborator – Irene Biolchini (Italy), Niki Young (Malta), Clive Zammit (Malta) and Sara Dolfi Agostini (Italy) respectively. The role of the collaborator was to follow the artist through their creative process, sharing ideas with them and documenting the progress. This project is supported by Arts Council Malta – Malta Arts Fund Project Support Grant.